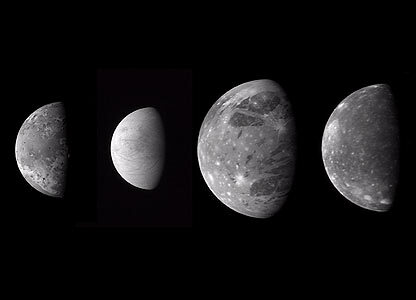 The New Horizons spacecraft has returned stunning new images of Jupiter and its moons. 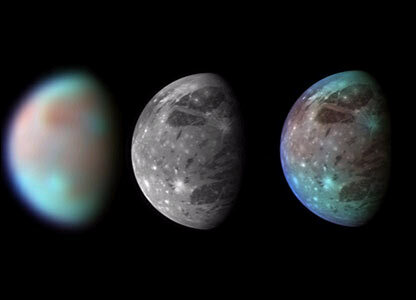 This montage shows the four Galilean satellites: Io, Europa, Ganymede and Callisto. The Little Red Spot is a storm the size of Earth swirling in Jupiter's atmosphere. Scientist Hal Weaver said the image resembled the painting Starry Night by Vincent van Gogh. 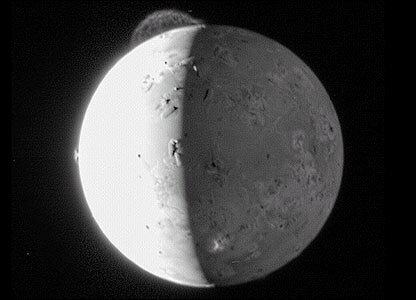 The Tvashtar volcano, near the north pole of the moon Io, was erupting during the Jupiter encounter. The dust plume forced out by the eruption rose 330km above Io's surface. 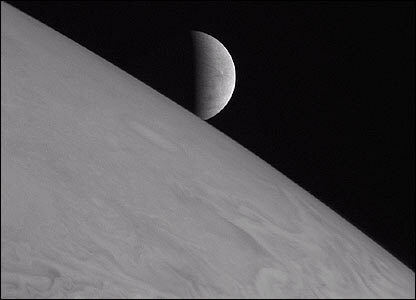 The icy moon Europa rises above Jupiter's cloud tops in this image taken on 28 February. Europa is thought to harbour a liquid water ocean beneath an outer shell of ice. The fiery moon Io (l) and frigid Europa (r) make an odd couple as they meet over Jupiter. 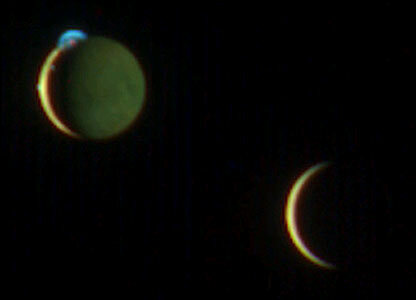 The blue semi-circle over Io is the plume from the erupting Tvashtar volcano. The top picture, taken on approach to Jupiter, shows three lanes of rocky material in the planet's rings. 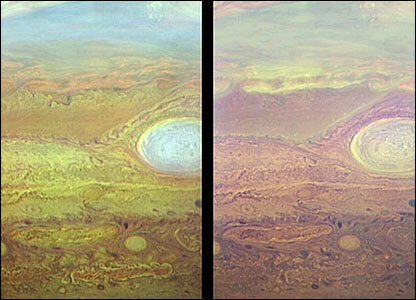 The bottom image was taken as the probe looked back after passing Jupiter. Jupiter's turbulent atmosphere appears here at infrared wavelengths. 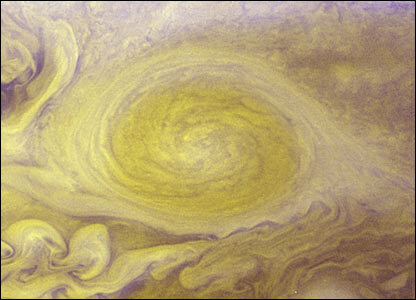 The large round feature is a huge storm known as the Great Red Spot - "big brother" to the Little Red Spot. 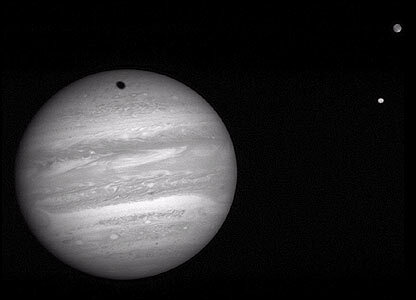 A shadow is cast on Jupiter by its largest moon Ganymede (top right). Below it is the planet's fiery moon Io, the most geologically active object in the Solar System. 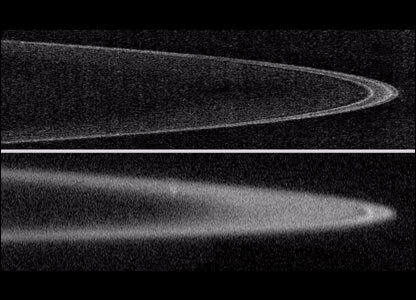 Jupiter's moon Ganymede appears at infrared wavelengths (l) which show up its surface composition and in a greyscale image (c). The image on the right is a combination of the two.